Ready to adventure past carrots and tomatoes, but not sure what to grow next? Give your garden a weird and wonderful boost this year, and discover five new things to plant and enjoy from Incredible Edibles. Attractive and easy to grow, cucamelons pack the refreshing taste of cucumber with the zing of a lime into one tiny, versatile fruit. They can be sliced and added to salads, pickled, cooked in stir-fries, dropped into cocktails or blended into a cooling sorbet. This popping variety of maize bears ruby-red kernels on miniature cobs that can be popped whole and the popcorn eaten straight from the husk. Popcorn-on-the-cob, anyone? The finger lime is a remarkable plant. Open up its fingerlike fruit, and tiny pearls with the taste of lime and grapefruit burst out under the pressure. Widely used to garnish seafood, the pearls have the exquisite texture of caviar and “pop” in the mouth. This deciduous fern is named for its resemblance to ostrich feathers. Its impressively large, bright green fronds emerge tightly coiled each Spring from the crown of the plant, and slowly unfurl. 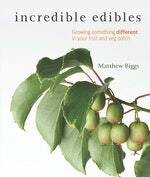 The size of a large grape, kiwiberries are the diminutive cousins of the fuzzy brown kiwi fruit common to supermarkets. No need to peel! These sweet, moreish berries can be enjoyed plucked straight off the rapidly growing vines.